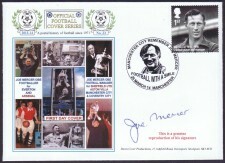 Royal Mail issued a stamp honouring JOE MERCER OBE footballer and Ex Manager of Manchester City FC. one of the most respected and popular gentlemen associated with football world wide. 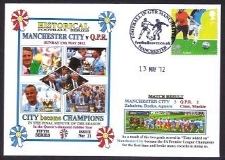 Dawn Cover Productions have sponsored a special Royal Mail handstamp which was used on the special Commemorative Postal Cover. 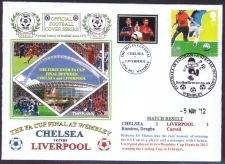 The cover forms part of The Official Football cover Series. The 20th series commenced at the start of the 2010-11 season and is still in operation. 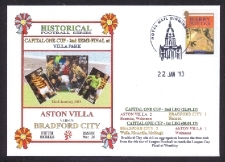 Top quality postcards were produced from 1994 for a number of years and the series of Steam Locomotives named after Football Clubs was independently considered to be the best new series issued. Each painting shows one of the 25 different Footballer Locomotives situated in a lifelike scene relating to that particular locomotive. 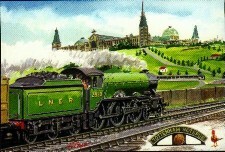 For instance the Spurs one is seen passing Alexandra Palace. This like other series of postcards was produced as a limited edition and prices vary depending on current stock available. They were also used as filler cards in the First Day Covers which also reproduce these magnificent scenes painted by leading artist G S Cooper. Besides the Football Locomotive Series, other Football postcards have been produced, and apart from a small number, they are all taken from special artist painted commissions. The Football artists concerned being Stuart Avery, Ean Gardiner and G S Cooper, although G S Cooper is more renowned for his evocotive transport paintings. A small series of die-cast vans were produced with paintings of the "Footballer" locomotives on each side of the vans. These were issued with numbered certificates but the series had to be terminated suddenly when the manufacturers could no longer supply any more. Under 500 were issued for Manchester United, and most were sold at the Manchester United Museum. Less than 200 of each of the others were issued so all are very collectable and they sold out quickly. The vans were produced for the following six footballer locomotives:- Arsenal, Manchester City, Manchester United, Newcastle United, Nottingham Forest and Sunderland. 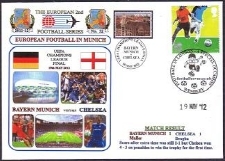 This cover commemorates one of the most amazing finishes to a football season that could happen - the Premiership being won on goal difference in the final minute of the season! Having spent most of the season in top position, City had dropped to 2nd and were 8 points adrift with 6 matches left to play and inferior goal difference! They won all 6 remaining matches and improved their goal difference significantly. 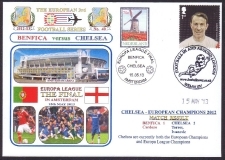 Handstamped on the date the title was won, a limited number are offered at £8 each plus £2 p & p.
CHELSEA came from behind to beat Bayern Munich in Munich to win the European Champions League Trophy in an amazing match. Another incredible end to the 2011-12 season. Chelsea are the first Club from London to win the trophy. The covers were handstamped in London and only a few remain at £10 each plus £2 for p & p and insurance for loss in the post. Please add p & p to all orders - for simplicity £2 is charged for all UK addresses for orders up to £40 in value which also includes insurance for loss in the post. For larger orders and for overseas orders please contact us first so that the insurance part of the postage can be discussed.